Colorado and and White Spruce. Larvae feed on the new needles leaving only short brown stubs. Once the new growth is devoured, the larvae move back on the branch and feed on the older needles. By July, infested trees appear ragged and yellowish-brown especially near the tops. 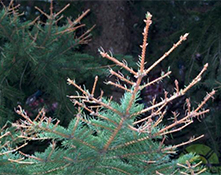 Heavily-infested trees may be completely stripped of foliage. Three to four consecutive years of moderate to heavy attacks can kill the tree. Sawfly larvae drop to the ground to overwinter as late instar larvae in spun cocoons in the soil under the host tree. Adult sawflies are reddish brown and emerge in the spring to mate just as the buds on spruce trees are beginning to swell. Females deposit eggs singly into the base of new needles. 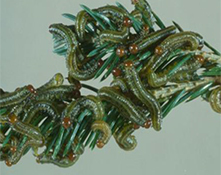 Larvae emerge within two weeks and begin feeding on the succulent needles. Feeding begins in June and lasts for 4-6 weeks. By early to mid-July the larvae are full grown and are about 20mm in length. Full grown larvae have brownish-orange heads and green bodies marked with six grayish-green stripes. The sawfly completes one generation per year. 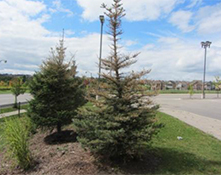 Infestations on a few small trees can be controlled by picking off and destroying the larvae when they are first noticed. For shelterbelts or large trees, chemical control can be achieved by using an approved insecticide. Insecticidal soap may reduce early instar populations. Target young larvae with pesticide applications when possible.